Latigo Canyon is one of the first twisty roads I sampled when I arrived in SoCal, and it remains one of my faves even after nearly 20 years. I recently headed back to that area for what’s sadly become an infrequent event in my life: a Sunday ride. It was delightful to dive into Latigo’s buffet of corners with only my pleasure in mind – no video sequences to shoot, no U-turns for yet another pass by a photographer, and no pulling out my notepad every 20 minutes to make sure every possible detail of a test bike is logged. It was just me and my bike on a wonderfully serpentine road. Well, actually, it wasn’t my bike and I wasn’t alone. 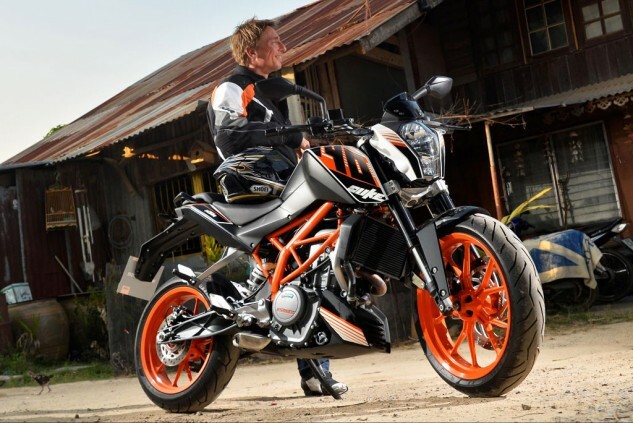 I was aboard KTM’s playful 390 Duke, winner of our Best Lightweight/Entry-level Motorcycle of 2015, and I was chasing one of my moto buddies, Eric Putter. Eric was aboard his Suzuki GSX-R1000 with some comfort and ergo mods that combine some of what makes the new GSX-S1000/F appealing but with full Gixxer power: near 180 hp at its rear tire. Meanwhile, the lil’ Duke transmits 40 horses to the wheel from its 373cc cylinder. 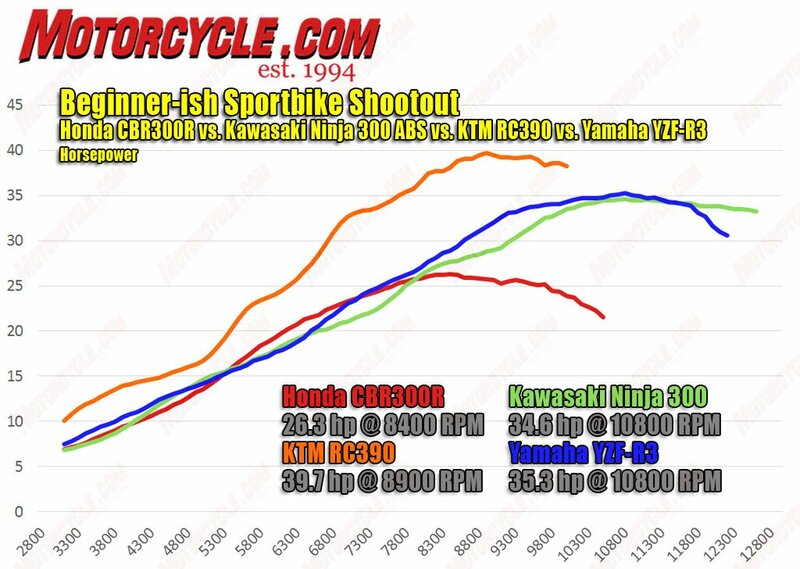 Producing less than 25% of what the big Suzi generates, the KTM was clearly outmatched, right? Wrong! Within the tight confines of Latigo and other nearby canyons, the Duke was able to hang right with the Gixxer on all but the longest straights, and I was keeping up and stretching a gap in the tightest sequences without exerting much effort – the huge grin painted on my face belied the bike’s modest $5k pricetag, which includes grippy Pirelli tires, a slipper clutch and standard ABS. KTM’s 373cc Single cranks out horsepower (and torque) numbers in excess of its class rivals, supplying superior punch from bottom to top. 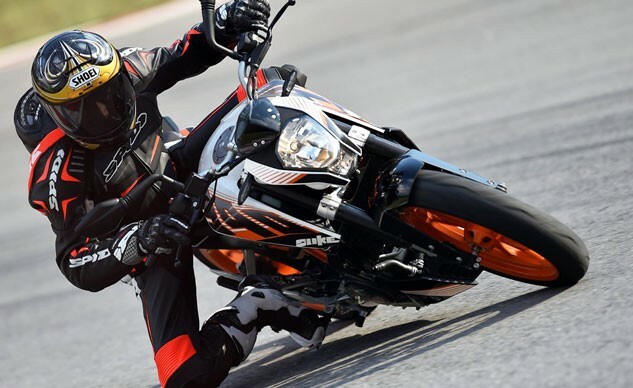 The 390 Duke has the same state of tune as the RC390 tested in our Beginner-ish Sportbike Shootout. At this point you might be thinking Eric can’t be a good rider if a 390 Duke can keep up with him on a Gixxer Thou, but, trust me, Eric’s speed is well beyond average. He and I actually have a similar pace on the street – keeping a solid margin for error – so staying close to him (again, except for the longer straights) while on a one-lung roadster like the Duke is a veritable achievement. 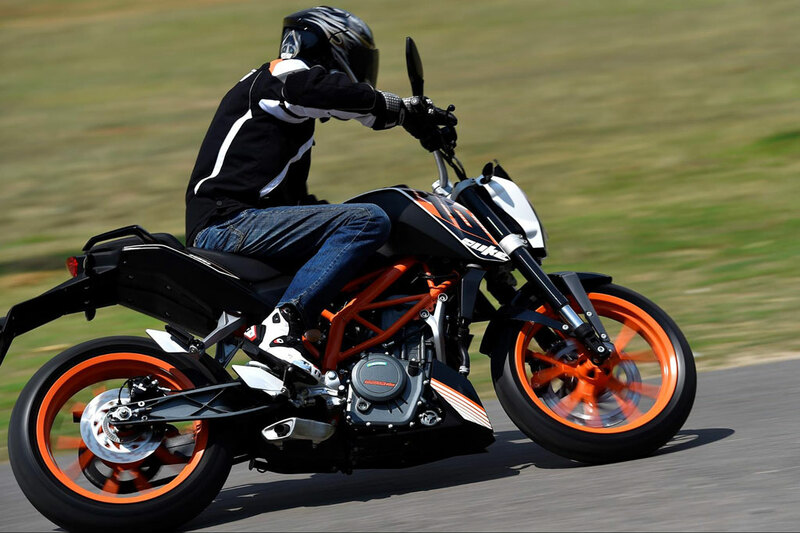 The richness of torque relative to its sub-400cc competition gives the KTM the rare-for-its-class option of two gears for any corner while maintaining entertaining velocities. Later, we switched steeds for a few miles. Eric’s bike is an excellent example of how a competent superbike can be transformed into a better streetbike (project bike story, anyone? ), endowing it with versatility for everything from errand running to sport touring. But on a tight canyon path, the sporty Gixxer GT felt a little like a Concours 14 after jumping off the crazy-agile Duke. Riding quickly required far more effort on the literbike: a much greater shove on the bars and much more concentration on monitoring and shedding speed. Honestly, the smiles were bigger and more frequent when aboard the Duke in these canyons. Later, while enjoying the panoply of motorcycles at the Rock Store, we ran into a MO reader who wanted to know if I’d endorse him buying Aprilia’s new and awesome RSV4 RF. Well, I’d advocate the lusty ’Priller to anyone who could afford one, but Adam was already riding one of the best sportbikes ever made: BMW’s HP4. My advice was to keep his HP4 for track duty and augment his collection with a Tuono 1100 for sporty street riding. There is no new bike priced less than $6,990 (Yamaha FZ-07) I’d rather ride to the legendary Rock Store. Having become quickly acquainted, I suggested we mount up for more riding. I led our trio aboard the Duke, while Eric took the tail end to keep an eye on our new friend. Adam proved to be a good rider, showing promising speed while keeping himself in control – no squid indications even when I pulled away while unwinding the tightest sections more quickly than the superbikes could. There were a few times I coasted while waiting for my cohorts. We blitzed our way all the way down Latigo and had so much fun we turned around and rode it the other direction. Back at the Rock Store, Adam took his first close look at the KTM I was riding. He bent over to look at the engine and then glanced back with knitted eyebrows and a puzzled look on his face. “Just one cylinder?” Adam queried. I grinned for the thousandth time that day and nodded in the affirmative. “But how does it have so much power?” he asked in disbelief. It should be noted here that if I were to design a perfect road for a 390 Duke, it would look a lot like Latigo, so the scale of the environment played a significant factor in how quickly it could be ridden. In the confined spaces of the roads in the Santa Monica Mountains, the 390 Duke can run with almost anything due to its extreme agility, relatively broad powerband and solid chassis. Sure, I could wish for stronger brakes, larger readouts on the gauges and a smoother gearbox, but the Duke is an incredible value for its $4,999 MSRP. It has unparalleled equipment in its class, easily cruises at 80 mph and above (I once saw 110 mph on its speedo…), and, to my eyes, it looks cooler than most bikes costing thousands of dollars extra. On that bright, sunny Sunday aboard the 390 Duke, the old adage “It’s more fun to ride a slow bike fast than a fast bike slow” was put into sharp focus. And if it can be true for me – someone who has ridden the fastest production motorcycles ever made – I hope you can see the possible relevance to you.